The Cities Alliance 2011 Annual Report defines the new strategic decisions and roadmap adopted by the partnership to revitalise its operations, moving forward, following its adoption of a new Charter at its Consultative Group meeting in Mexico City in November 2010. The Cities Alliance 2011 Annual Report defines the new strategic decisions and roadmapadopted by the partnership to revitalise its operations, moving forward, following its adoption of a new Charterat its Consultative Group meeting in Mexico City in November 2010. Over $12.3 million of funding allocations were approved during the year under review, with most of the approved funding, US$8.3 million going to country/regional projects. Nearly 44 percent of the country and regional approvals were for Sub-Saharan Africa, reflecting an increased prioritisation of the region as agreed by the Cities Alliance membership at its Mexico City meeting. The remainder was used to fund global knowledge and communication activities and the costs of the Cities Alliance Secretariat. Significant progress and outcomes were also recorded in the Country Programmes (CPs) in Uganda, Vietnam and Ghana. In the Transforming Settlements of the Urban Poor programme in Uganda (TSUPU) the framework of national dialogue, local-level good governance and community voice provided the underpinning for a new World Bank capital investment programme of $130 million in 13 secondary towns, including the five CP towns, while new Country Programmes were launched in Burkina Faso and Mozambique. 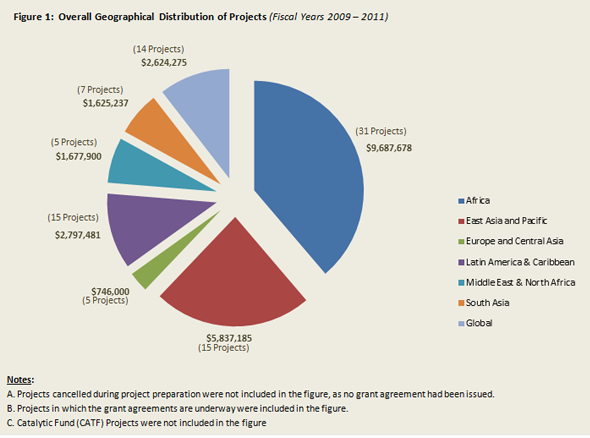 Additionally, the first Call for Proposals for Applications to the Cat Fund was launched during the period, resulting in a batch of 74 Concept Notes in response, on a broad range of projects related to economic, environmental and social aspects of urban development across regions – Sub-Saharan Africa, South Asia, Latin America, and Central Asia. Of these, 45 met the eligibility criteria. Major publications released by the partnership during the period include the Quick Guides for Policy Makers on Housing the Poor in African Cities, launched in Nairobi during UN-Habitat’s 23rd Governing Council Meetings; and, Climate Change, Disaster Risk and the Urban Poor launched at the C40 Summit of Large Cities held June 2011 in São Paulo, Brazil by World Bank Group President, Robert Zoellick. A unique feature of this year’s report is its publication as a web-based multimedia document featuring video introductory messages from William Cobbett, the Cities Alliance Manager, from Steve Weir of Habitat for Humanity International (HFHI) and Zoubida Allaoua, Director, Finance Economics and Urban at the World Bank Group. It also features more succinct presentation of the Annual Report chapters, as well as links to downloading the full report. Over US$12.3 million of funding allocations were approved during the year. Most of the approved funding - US$8.3 million - went to country/regional projects. The remainder was used to fund global knowledge and communication activities and the costs of the Cities Alliance Secretariat. Nearly 44 percent of the country and regional approvals were for Sub-Saharan Africa, reflecting an increased prioritisation on the region agreed by the Cities Alliance membership at its 2010 annual meeting held in Mexico City. Funding proposals from the old grant facility totalling US$3.6 million in Core funds were processed and approved for 13 projects. The new Catalytic Fund was launched in January 2011 and the first cohort of Catalytic Fund projects, estimated at US$1.75 million, was approved during the first half of FY’12. The Australian Agency for International Development (AusAID), signed a new three-year agreement with Cities Alliance which will provide US$2 million in each of the next two years, on top of a US$350,000 contribution for FY’11. Significant progress and outcomes were recorded in the Country Programmes (CPs) in Uganda, Vietnam and Ghana. In Uganda’s TSUPU, the framework of national dialogue, local-level good governance and community voice provided the underpinning for a new World Bank capital investment programme of $130 million in 13 secondary towns, including the five CP towns. New Country Programmes launched in Burkina Faso and Mozambique. The First Call for Proposals for Applications to the Cat Fund launched; 75 Concept Notes received with 45 meeting eligibility criteria. In January 2011, the publication, Making Room for a Planet of Cities was launched in Washington DC by Cities Alliance, Lincoln Institute for Land Policy and the World Bank. In April the Quick Guides for Policy Makers on Housing the Poor in African Cities was launched in Nairobi during UN-Habitat’s 23rd Governing Council Meetings. This was followed in June by the launch of Climate Change, Disaster Risk and the Urban Poor at the C40 Summit of Large Cities in São Paulo, Brazil by World Bank Group President, Robert Zoellick. In July 2011, a Special Session of the Ghana Urban Forum on “Shaping Ghana’s Urban Future” held in Accra progressed the ongoing activities to define the challenges and opportunities of urbanisation and to engender attitudinal changes at the official level towards the urban poor.